First World Tour Events of 2012! 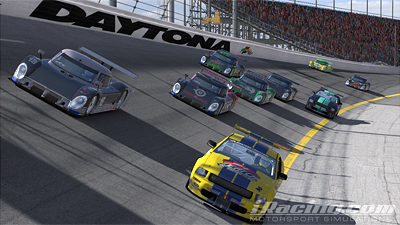 The iRacing World Tour once again features in 2012 and the first event was the ‘Roar Before The 2.4′, a one hour race at the Daytona International Speedway. The event saw a 60 minute multiclass event where the VW Jetta TDi, Mazda MX5 and Pontiac Solstice shared the track to compete in three separate class races. I was very much a Solstice racer in my early days in iRacing (~2008) so welcomed the chance to race it again in a main ‘marquee’ event such as the World Tour so the choice of car was very easy for me. A total of 787 racers took part in the Roar and my race session had 11 race splits (I was in the second split). A full race list of 41 cars took part in my race, with 9 Solstices (including me) – not bad for an entry list. 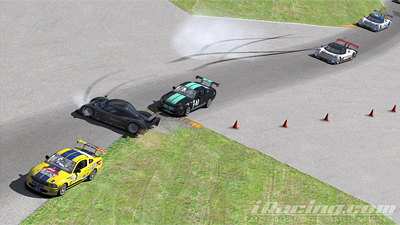 Unfortunately my race was severely affected by a collision on lap 2, just a few minutes into the 60 minute race. At the bus stop a fellow Solstice driver behind me lost control of his car, cut the bus stop chicane and speared into the side of my car leaving me with no chance to avoid their out of control vehicle. Annoyingly that had me limp to the pits and repair my car, costing me several minutes of track time and put me a lap down. The rest of my race was reasonably uneventful as I just put the laps away and only gained positions when Solstice drivers ahead either crashed or blew up their engines! I was still pleased to make it back to 4th place out of the 9 racers in my class. 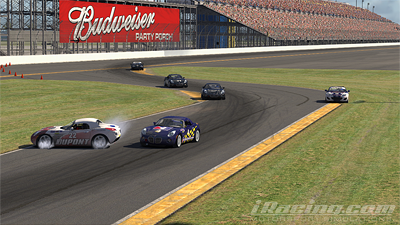 The disappointment continued the next day with the weekends main event – the iRacing 2.4 Hours of Daytona. This main event has a chequered past for me. In 2010 (the first year of running) the event was not multiclass and generally was a big success. 2011 turned out to be a disappointment after not making it to the chequered flag. This year was unfortunately another disappointment but surprisingly (to me) it wasn’t due to it being multiclass, or me getting wrecked. The problem was hardware related. 1094 racers registered and formed 26(!) race splits. I was doing really well in split 6, having worked my way up to second by lap 11, only for my PC to lock up and blue screen! By the time I had restarted the PC I was mired in the back, around 30th place with a very long amount of racing left to do. I couldn’t really muster the enthusiasm for another solitary race just hoping to gain positions from the retirees so I called it a night and quit the race. Here’s hoping the 2013 event improves on these results (it would be hard not to!). The next World Tour event is the fabled iRacing Daytona 500 on 25th February 2012. I had mixed feeling about this years Rolex 2.4 event. Last years event featured the Daytona Prototype only (and it was a GREAT event). 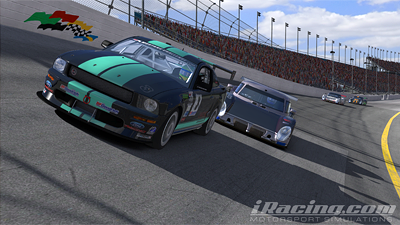 This years was a multiclass event featuring the Daytona Prototype and Ford Mustang FR500S. I’m not a huge fan of multiclass events, but I really wanted to race the event so I chose the Mustang and set about joining the race. Clearly, multiclass racing with two different car classes is difficult and very risky, but the race got off to a good start. My split had 29 Daytona Prototypes and 11 Mustangs. We got through the first lap well, slowing down for some pretty big Prototype crashes, and the chasing Mustang pack settled into the long race ahead. We were doing a good job when the DP’s started to catch us. The first few were reasonably spread apart, but the following pack of Prototypes caused havoc in the bus stop, and a spinning Prototype veered directly into my car and destroyed my race – lap 4. I used my reset and set about racing once more. I was the only Mustang out of the 11 who had used a reset so I was stuck in 39th place, racing no-one (very boring!). A few laps later it got a bit busy entering the oval section – Prototypes going high and other Prototypes going low. As a slower class car, changing your line = death, so I gritted my teeth and held the middle of the track. Unfortunately a following Prototype clearly thought I was not going to hold my line and drove into the back of me, causing a wreck (and involving a few other cars too). So, wreck number 2, race over. Can’t say I didn’t expect it, a disappointing start to the 2011 World Tour.